FILE - U.S. President Donald Trump speaks with Philippines President Rodrigo Duterte during the dinner marking ASEAN's 50th anniversary in Manila, Philippines, Nov. 12, 2017. The United States’ tacit acceptance of Philippine President Rodrigo Duterte’s deadly campaign against illegal drugs is expected to put the worst in bilateral relations behind them and lead to renewed cooperation between the two longtime allies despite a wary China. U.S. Deputy Assistant Secretary of State James Walsh said in a telephone news briefing Jan. 31 he was “cautiously optimistic” about how the Philippines is ridding itself of illegal drugs and that Washington would support the campaign as long as it was done legally. Activists believe the Duterte government has let police kill as many as 7,000 people, without trials, since taking office in June 2016. Walsh’s comments “hint of a growing appreciation of the positive impact of the administration’s anti-illegal drug campaign,” the Philippine presidential website said. 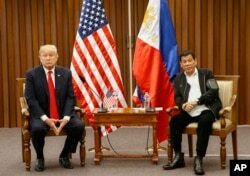 That exchange, following an upbeat meeting between Duterte and U.S. President Donald Trump in November, begins to push back a storm of comments that the rough-spoken Philippine leader has made against the United States largely over its criticism of the anti-drug campaign. Duterte paired his remarks with the establishment of friendly ties with U.S. Cold War rival China. “You could just say that probably (the relationship) has sort of stabilized,” said Jay Batongbacal, a University of the Philippines law and international maritime affairs professor. FILE - People take part in a protest against the government of Philippine President Rodrigo Duterte in front of the Philippine consulate in New York, Dec. 10, 2017. After Duterte took office on popular pledges to stop sales of illegal drugs, human rights groups accused him of letting police shoot to kill suspects without trial. His approval ratings grew at home as Filipinos felt crime was easing, but the U.S. government under then President Barack Obama criticized the suspected extrajudicial killings. Washington withheld millions of dollars in funding for the Philippine National Police after pledging $32 million for Philippines law enforcement. Duterte once used profanity to describe Obama and asked the United States to leave the Philippines. The United States exercised colonial rule over the Philippines for about 50 years, and the two sides retain a series of mutual defense agreements. After domestic protests last year over the police killings of teens during drug busts, Duterte retrenched. In December, the Philippine Drug Enforcement Agency took over anti-illegal drug operations, with police and others offering backup. FILE - U.S. President Donald Trump, left, and Philippine President Rodrigo Duterte hold a bilateral meeting on the sidelines of the 31st ASEAN Summit at the Philippine International Convention Center in Manila, Philippines. Nov. 13, 2017. When Duterte met Trump in Manila in November, the U.S. leader avoided criticizing the Philippine leader. Walsh’s comment this week adds to Trump’s gesture. “With the announcement, I think the U.S. government is betting on warmer ties, improved relations, on top of what they already have now,” said Renato Reyes, secretary general of the Bagong Alyansang Makabaya alliance of left-wing Philippine organizations. 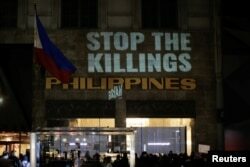 The alliance has protested the deaths during the anti-drug campaign and worries that Trump is turning a blind eye to any continued extrajudicial killings. Stronger relations with the United States could restore law enforcement cooperation while protecting an economic relationship, experts say. The United States ranks among the top foreign investors in the Philippines with more than $4.58 billion in existing direct investment. It’s also a source of jobs for 3.4 million overseas Filipino workers. The United States shows signs of aiming to deepen defense aid to the Philippines, which some consider pivotal to the wider U.S. military position in Asia aimed at containing the expansion of the region’s strongest country China. Last month the United States announced its “Operation Pacific Eagle-Philippines” effort to stop terrorism on the restive southern island Mindanao, where Muslim rebel violence has left about 120,000 dead since the 1960s. Philippine troops battled one rebel group for five months last year. The U.S. Embassy in the Philippines also began a $358,000 effort this month to help 37 social welfare projects, also in Mindanao. The two sides still conduct joint naval exercises every year but have recently avoided the South China Sea where Manila and Beijing remain locked in a maritime sovereignty dispute. FILE - Philippine President Rodrigo Duterte, left, and Chinese President Xi Jinping pose for photographers on the sidelines of the Belt and Road Forum for International Cooperation at the Great Hall of the People in Beijing, May 15, 2017. Duterte befriended Beijing in late 2016, earning $24 billion in pledges for Chinese development aid and investment in projects such as railways. Trump hopes his ties with the Philippines will stop Manila from getting any closer to China, said Eduardo Araral, associate professor, National University of Singapore’s school of public policy. Seventy percent of Filipinos indicated trust in the United States at the end of 2016 and 39 percent voiced the same for China, Metro Manila research institution Social Weather Stations found in a survey. What follows from the Walsh comments depends how other U.S. leaders treat the Philippines going forward, Araral said. Duterte might not come around so fast to Washington anyway, Batongbacal said. He had resented the U.S. government’s role in the Philippines even before taking office. “It’s not really a big change, I think, because if you compare it to, say, how he still conducts his foreign policy vis-a-vis China or even in comparison with the EU it’s all still basically the same as before,” he said.